My PayPal has been taking a hammering this month but I'm pretty much done now. I'm waiting on some Owner ST66 trebles to re-rig those that I'm fitting with that style of hook. I'll also be trying singles with a split ring, swivel. split ring option. I did this in Norway on pirks a few years back and it worked a treat with less fish lost. On the likes of the Roberts Ranger(centre left) and Wake chisel nose baits next to it , this seems to work well from what I can see. 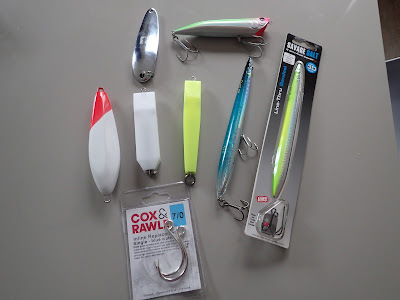 These lures are designed to be skipped across the surface and worked like this for fish such as Roosters, Striped Bass, Leerfish and Bluefish. Who doesn't like a bit of surface action? I have a few bits and bobs in the garage that can be used including the large size Mag Popper that I was kindly given a few years back but not used. Garfish seem to figure heavily on the their menu so the style and casting ability of some of my other choices makes sense to me. I picked up a couple of 3 ounce chrome spoons as I can imagine there will be a lot of mullet around. The roll and flash of these fish is bound to attract Leerfish so these heavy spoons might come in handy. I might also try them bounced along the sand on the surf beaches to see if I can pick up a Corvina.